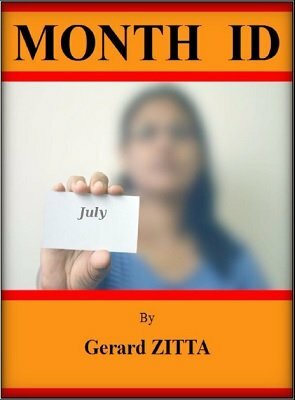 Month ID is an original method to secretly gain knowledge of a stranger's month of birth. (Actually, any information among twelve possibilities...) It can be done independently, anytime, anywhere, without any preparation at all, or props. The result will get you the knowledge of their birth month, without any question. You will also get a bonus fake newspaper article, to make everything credible for the audience, and easier for you. NOTE: Instead of revealing the month, this can be followed by ZIP , my Zodiac sign prediction when I meet somebody I've never seen before. (You do not need to know the day of birth for ZIP ). 1st edition 2016, 15 pages. I recommend this effect highly. With the bonus fake article you can simply read the article out loud and have the spectator participate and know their month of birth WITHOUT ANY MEMORY WORK!!! By the way, I printed the article on cardstock...it looks like a real old (2003) article. People born during the month of (MONTH) with a Zodiac Number of (ZODIAC NUMBER) then cold reading statements. Again I highly recommend this. The article takes away some of the memory work and I can use my memory work on the cold reading statements. For price and the effect itself I give this a 20+. Please note that I am collecting all sorts of Star Sign based revelations so I am just saying this is an unusual approach that will work for me when the conditions are right.